Enjoy Hanagasa Festival in Yamagata! Hanagasa Festival(Hanagasa Matsuri) is Japanese traditional festival, people dance and parade with hat adorned with flowers. This festival is held in several places, but Yamagata Hanagasa Festival is most famous in Japan. It is one of the four major festival in Tohokoku region in Japan. 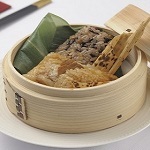 Its origin is Zaoh Summer Festival held to promote Zaoh tourism in 1963. It was a part of Zaoh Summer Festival as Hanagasa parade, but it separated from Zaoh Summer Festival and change its name to Yamagata Hanagasa Festival in 1965. 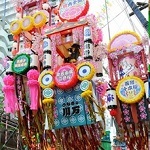 It is held for three days from August 5th to 7th every year. About 13,000 people dance with singing "Yassho Makasho" to local music of Yamagata, Hanagasa Ondo. Festival cars lead them, and they parade main street of Yamagata city. All of the people live in Yamagata can this dance and sing music because they heve danced since they were students. Visitors can join rear of the dance parade in this festival and Waodori space near the goal of this parade at 18:00. They can be taught how to dance it by dance teacher near parade if they don't know this dance. By the way, there are many stalls called Yatai along the street. One of the Yamagata's specilities is Tama-Konnyaku which is jelly made from konjac(devil's tongue). It boiled and seasoned with soy sauce and dashi(Japanese soup stock) of squid. Japanese style skewered beef called Yonezara's Gyu-kushi is also delicious. Yonezara city in Yamagata prefecture is famous as a cattle farm, and its beef called Yonezawa beef is known as one of the three top beef brands of Japan. 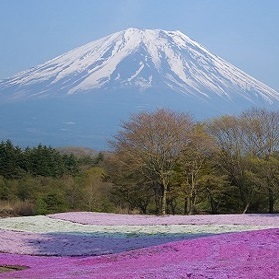 It takes three hours from Tokyo to Yamagata by Shinkansen train. If you travel Japan in August, you can enjoy this festival, and experience Japanese culture through it. Midsummer day of the ox and eels!? Go Kochi and Enojoy Yosakoi Festival! Go Kyoto and See Gozan-no-Okuribi!